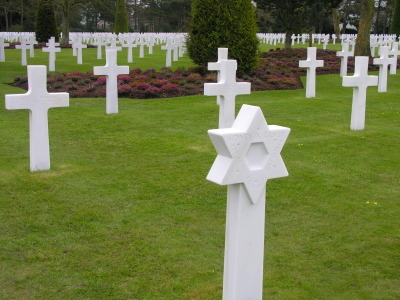 American Military Cemetery, Colleville, Normandy, FranceMost have the Latin cross inscribed on them, with an occasional Star of David. The writing engraved on the crosses tells heartrending stories. I read the names, ages, unit, state, and the date these young men were killed on. They come from 49 States of the Union, the District of Columbia and Guam. A 19-year old from Ohio, a 21-year old from Oklahoma; both died within a few days of the landings. They never got to live full and productive lives, get married, or have families. I see crosses with Pennsylvania, Michigan, New York, and Washington marked on them. Paratroopers from the 81nd and 101st Airborne Divisions; infantrymen from other American divisions. Most young, no older than the students I have taught for the past 17 years. I am numbed—don’t know if I can hold back the tears. I keep thinking there must be something I can do to honor them. Finally I mutter a brief prayer and say “thank you” to them—that’s the best I can do. I’m sorry they died not knowing their ultimate sacrifice to free enslaved Europe from the Nazi shadow would be successful. Searching for some consolation, I hope these soldiers would be pleased to know that so many people visit this place to remember them and their sacrifice. Maybe they might have thought it was worth it. People around me walk slowly around dazed, as if in a trance. We avoid eye contact. Most people have moist eyes, and it’s not from the gentle wind blowing across the bluff. The intensity of the emotions this cemetery stirs up is stunning. There’s no noise except for the breeze in the Laurel, Cypress and Holly Oak trees lining the sides of the cemetery, adding a feeling of serenity to this emotionally overpowering place. 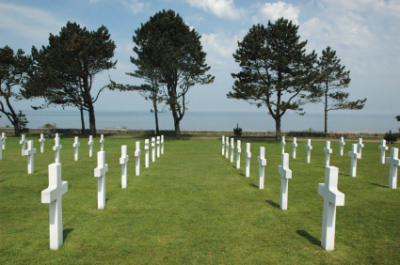 American Military Cemetery, Colleville, Normandy, FranceThe Chapel is constructed from a beautiful white limestone. “I Give Unto Them Eternal Life and They Shall Never Perish” is written across the front of the black and gold antique altar. Walking towards the exit I stop in front of the 22-foot tall bronze statue, titled “The Spirit of American Youth Rising from the Waves”. 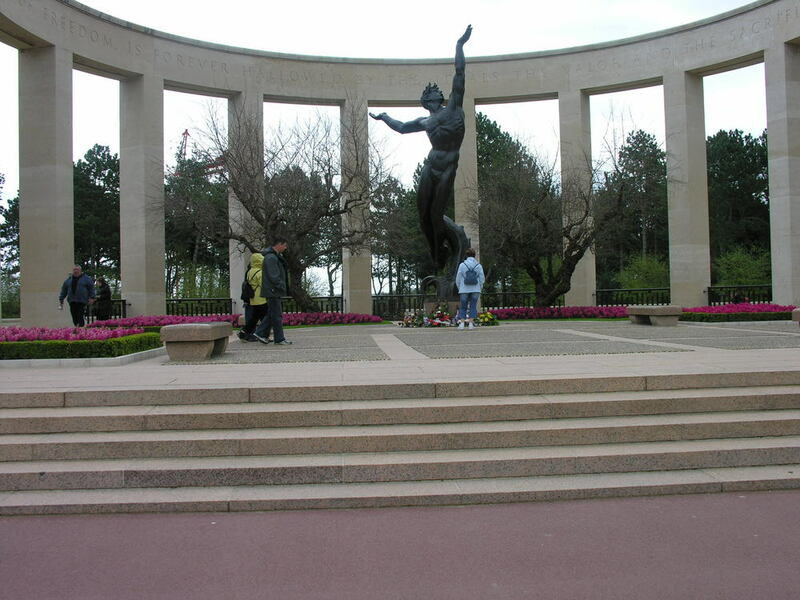 Even though I have never done any military service in New Zealand or my new adopted country, the United States of America, I salute the statue, and leave.